Even if you don’t know much about Zanzibar the Arabian rhythm of the syllables paints the picture for you. Pirates and prostitutes, tourists and thieves; bargaining and bribery at the waterfront by day, furtive transactions in the shadows of the night. Thirteen of the Cross-Cultural Solutions volunteers entrusted our first weekend to an entrepreneur named Kennedy and headed for Zanzibar on a Friday afternoon. The trip included a two-hour ferry ride from Dar-es-Salaam, a small leap of faith as ten days earlier one of the Zanzibar ferries rolled over in heavy seas and an unspecified number of people drowned, by some accounts more than 150. But with Kennedy’s assurance we took a bus to Dar and had an uneventful shuttle across this piece of the Indian Ocean to Stone Town, the heartbeat of Zanzibar. Zanzibar is from Arabic and means “Coast of Blacks”. It is really an archipelago consisting of 50 islands but only two are inhabited: Unguja, which is universally known as Zanzibar, and Pemba. It was discovered by Arab and Portuguese traders and was a Portuguese property until 1698. In the 18th and 19th centuries it was Omani, and then Britain claimed it as a protectorate. After Britain offered independence in 1963 an Arab minority took control, a remnant of a former Omani regime. A year later 700 African revolutionaries overthrew the Sultan of Zanzibar and his Arab government, with estimates of the death toll ranging from several hundred to 20,000. The new administration was feared by the west to be leaning to Communism but that turned out not to be the case, and later in 1964 Zanzibar and Tanganyika united to form what is now Tanzania, although Zanzibar remains semi-autonomous with its own president. One million people currently live on the two islands, and the principal industries are tourism, and the export of spices and raffia palm trees. Here are three useless but fun pieces of Zanzibari trivia. Zanzibar was the birthplace of Swahili and is considered home to the purest form of the language. In 1973 it became the first place in Africa to introduce color television. And the great Freddie Mercury, former lead singer of Queen, was born in Stone Town as Farrokh Bulsara. I’ve been reading a book about Zanzibar called “The Last Slave Market”. In the late 1800s, after slavery had been eliminated from the west coast of Africa, the practice still flourished on the east coast because of demand from the Arab countries, and Zanzibar was its epicenter. Natives were captured by slavers and ivory traders in Africa’s interior, brought in chains to the coast and taken by “dhow” to Stone Town. Those that died en route or were too sick or weak to fetch a decent price were thrown overboard in the harbor to avoid the tariff; the bodies washed up on the shore to be eaten by the dogs and the crabs. We checked in to the Swahili Beach Resort, had a good dinner and retired to prepare for an early wake-up call to swim with dolphins. Kennedy had everything well coordinated and we met guys on the beach who had life vests and snorkelling gear. Eleven of us got into two rickety boats with 20-year-old motors and non-English speaking “captains” and headed out to sea, where the dolphins were thought to be. Our driver had a phone in a baggie and he was on it constantly, asking his buddies if there was a sighting. After 30 minutes or so we came across some dolphins and were told to get our gear on. Our guy positioned the boat and yelled, “go, go, go … look down, look down!” I was the first one in the water and never saw anything but blackness, but I did see ten other boats that I was quite sure didn’t see me. It was hysterical. After getting in and out of the boat several times we did the dolphin dance with the other boats again, looking for fins amid the swells, and five minutes later the captain tapped me on the shoulder and said: “We go snorkel now.” Swimming with the dolphins was officially over. Before we left the area we pulled a couple from Denmark out of the water; the engine on their boat had failed and they needed a ride back. The woman was feeling poorly and spent the remainder of the trip leaning over the side, and a few of our folks were in a similar condition; these were small boats and the sea was choppy. The snorkelling lasted approximately 90 seconds because there was nothing to see; we opted for breakfast and spent the rest of the day reading or sleeping by the pool. The TVs in the room didn’t work well but one in the bar did, and I checked in throughout the day to catch whatever Olympic coverage was available. It was a very relaxing day, and gave us all a chance to get to know each other outside of our regimented volunteer environment in Bagamoyo. On Sunday, before catching the ferry back to Dar-es-Salaam, we visited a spice plantation and had an historical tour of Stone Town. I wasn’t especially looking forward to the former but it was actually quite interesting. A delightful man who called himself “Mr. Spice” gave us the tour, and in an area that couldn’t have been more than half an acre we saw papaya and mango trees, lemon grass, aloe plants, jack fruit, white and dark cocoa, cardamom, nutmeg (pictured), clove, taro root, turmeric, star fruit, coconut (the yellow for drinking, the brown for eating), cassava, allspice, cinnamon, bread fruit, pineapple, anato dye, mbilimbi (substituted here for lemons and limes), peppercorn, a coffee tree, ginger, henna, a vanilla vine and probably a few I missed. They served us a great lunch and sold us spices. I bought a bar of clove soap and have smelled like a Christmas ham ever since. During the tour, two or three of the young guys working on the farm walked with us and made things out of leaves: rings and bracelets and an origami-like frog for the ladies, a necktie and glasses for the guys. 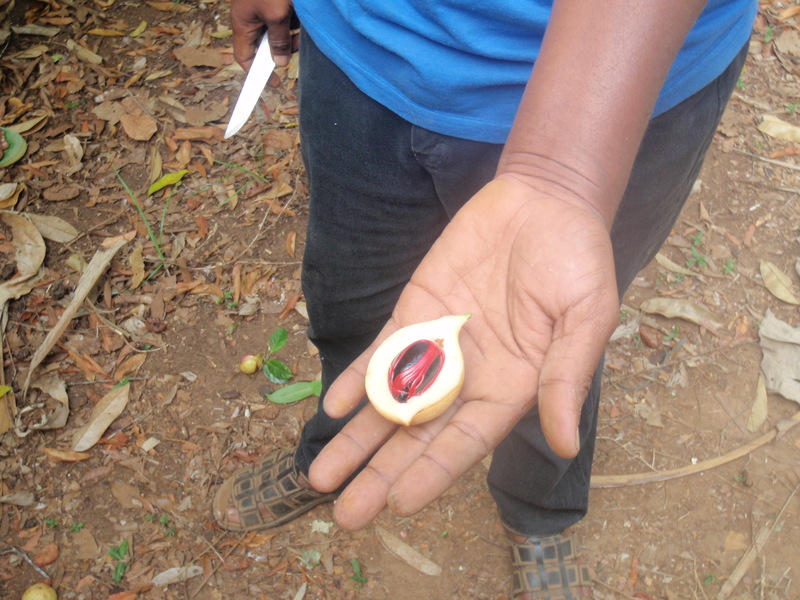 They presented these to us while holding a cone-shaped palm-frond receptacle already primed with a 10,000 shilling note ($6.25), and said: “Now tip please”. No problem, my friend, it was well worth it. 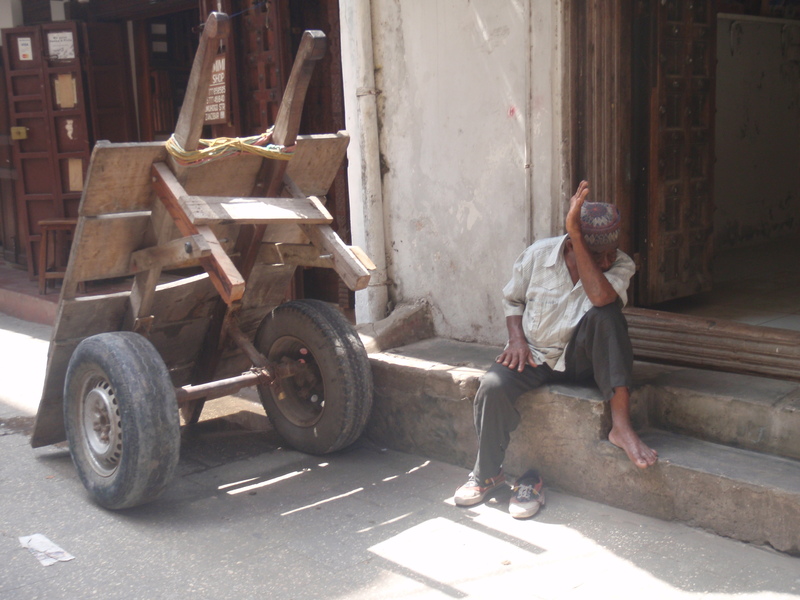 Our time in Stone Town was brief and predictable. We took a walking tour of some of the historical sites, starting with an Anglican church created in 1874 that was the primary slave market before that. In the basement are two cramped rooms, where an unfathomable number of men, women and children were jammed awaiting their sale to Persian traders. 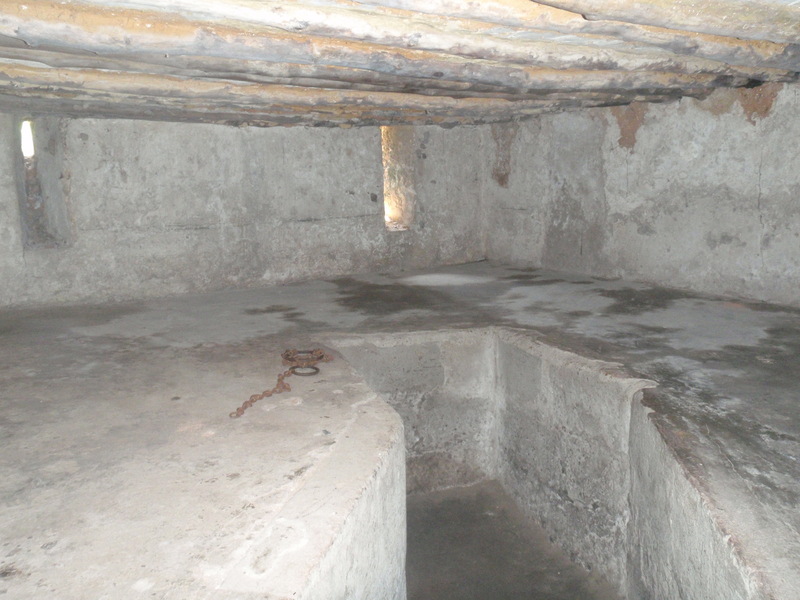 The rooms – concrete shelves, really – still feature some of the original chains. Outside the church is a creepy monument to honor the slaves, statues of five black people in a rectangular concrete hole, four of them in chains and the fifth representing the slave designated to keep the others in line. We took a break at a hotel called The Africa House, a beautiful old building that had been a club for British gentlemen in the latter half of the 19th century. 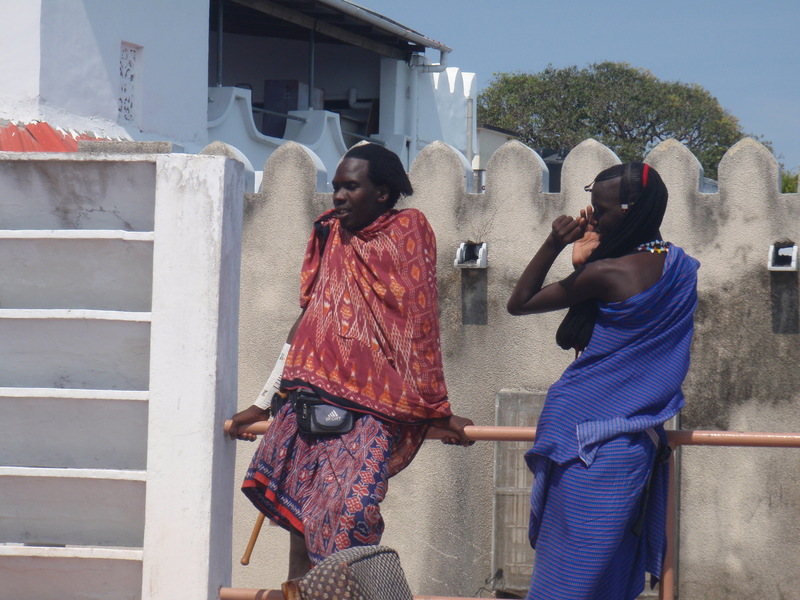 Two Masai warriors working in the hotel were chatting off to the side and looking like two bored hotel workers anywhere, except for the garb. I had a beer on the patio overlooking the Caribbean-blue water, and all I could think about was the bodies washing up on the shore 150 years earlier. Even though it was Sunday, and Ramadan, the order of the day in Zanzibar was commerce. The market for locals on the old town side of the main road was doing brisk business. We glanced in the general direction of the fish market, with wicker baskets full of Spanish mackerel, goatfish, snappers and parrotfish ripening in the sun, but no one had the appetite to venture in. I walked out of the sunlight and into the chicken market, and immediately wished I hadn’t; it was filthy, with chicken droppings on the floor and flies feasting on piles of gizzards and chicken parts. I snapped a quick picture, said “Hujambo” weakly to some angry vendors and hustled out. 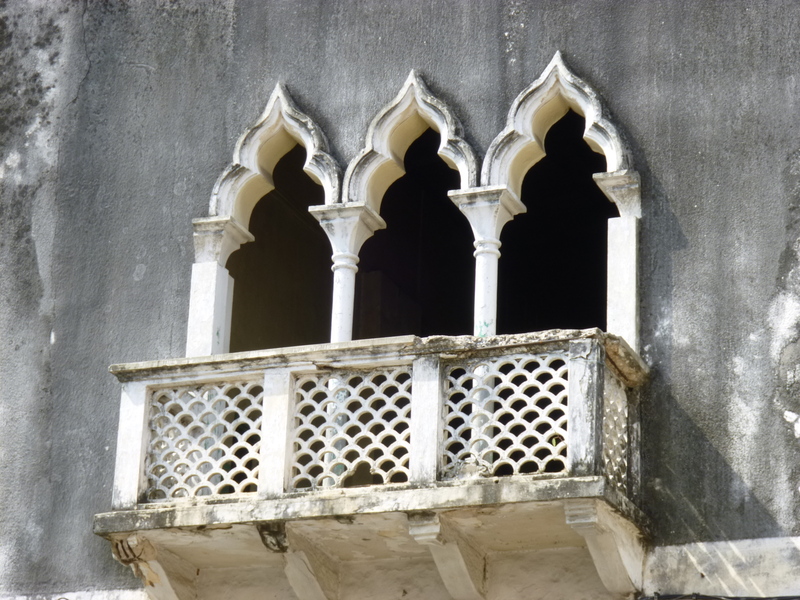 We walked a long way through the narrow, twisting streets of Stone Town, and our guide pointed out the variety in the architecture. There are very obvious Arabic and Indian features in the windows and doors, with some African and western influences mixed in. The doors in particular were once great status symbols and are consequently very ornate, some with spikes protruding in an Indian style that was meant to protect against elephants. You keep your head on a swivel in Zanzibar. If there are any regulations regarding traffic in this labyrinth of alleyways, they are unenforced. There is no way motorbikes should be allowed in the narrow streets but they are, and they come at you from all directions, as do donkey carts and push carts and bicycles laden with enormous piles of wood. An extremely old man struggled pushing a bicycle with three huge sacks of goods somehow attached. As he turned a corner he stalled going up a slight incline, and I walked over to give him a push. He brushed me away icily, executed a three-point U-turn, and slowly disappeared back down the street he had just made a monumental effort to traverse. 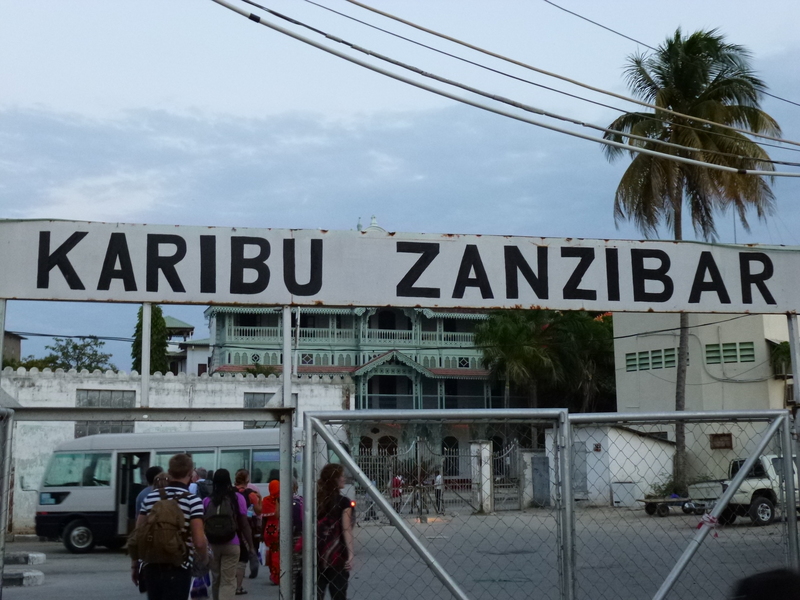 As we boarded the ferry and pulled away from Stone Town I knew I had not seen the real Zanzibar, the one conjured up by the name, and I felt a desire to return and do it differently. Ramadan ends on Friday the 17th and the fasting is over and the bars reopen and the locals dress up in their finest clothes and rejoice. 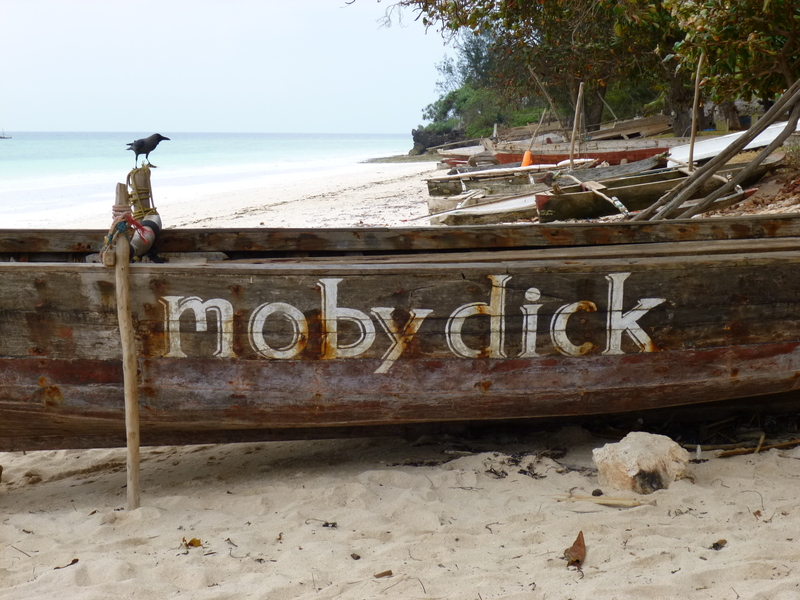 That could be a memorable weekend on the island of spices and slaves. Sounds like Zanzibar was a very good learning experience – I was following your blog pretty good until the Chicken Coop part – ugh! The slave holding area looked much like the one in Charleston…interesting how some things a world apart remain the same…also amazing was how many different plants they could cultivate in such a small area….love the history you bring to your writing experiences…stay well – we miss you and don’t drink the water! I will leave a comment this time instead of regular email……..You saw no DOLPHINS because they have disappeared just like the JAGS!! Once again, enjoyed the post! Be Safe!